Are you curious about the health benefits of swimming? As you may be aware, swimming has the reputation of being one of the best sports to maintain a healthy body. This article will explain why this is the case and cover the main benefits one can enjoy by committing to a regular swim schedule. The first benefit of swimming is that it is a whole body workout. Indeed, swimming requires that you engage all of your limbs. As a consequence, all the muscles in your body are mobilized during a typical swim workout. This effect can even be compounded by alternating the swimming strokes used during a workout because each swim stroke lets you move your limbs in a different way. And because swimming mobilizes your limbs across a wide range of movements, it promotes joint flexibility. The health benefits of swimming don’t stop there. Swimming is an endurance sport, and as such an excellent cardiovascular exercise. Swimming exercise reduces your blood pressure, strengthens your heart and improves your aerobic capacity. It can be practiced safely by seniors. Swimming can be practiced during the pregnancy. It can be practiced as an alternative exercise for injured athletes. It can be practiced by overweight people. As the water resistance increases with speed, every swimmer can easily dose the intensity at which he wants to work out. Swimming is also an excellent alternative to dry-land exercise. For example, it can be practiced in the summer when it is too hot outside to work out. It can also be a welcome alternative to bored or injured runners. There are other health benefits of swimming. As an endurance sport, swimming allows you to lose or control your weight. It burns about three calories per mile per pound of body weight. To be useful for weight control, you need to swim at least two or three times a week for at least half an hour. If you are overweight, swimming is the best way to lose weight as you will be able to work out safely without putting too much stress on your joints. Swimming is often prescribed to patients that experience back problems and pain. Swimming backstroke is an excellent exercise to loosen up and strengthen the back. 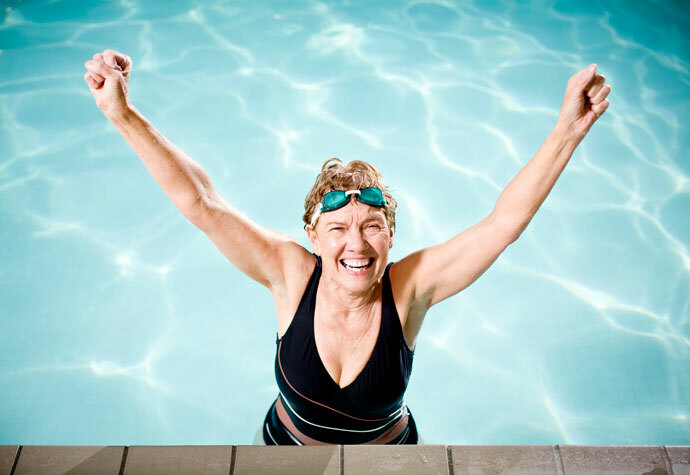 Swimming is also an excellent exercise for people that suffer from arthritis because of the support and soft resistance of the water. The health benefits of swimming are many. As swimming is a low-impact exercise, you would think that there aren’t any downsides to practicing this sport. This isn’t the case however. Even if swimming is a low-impact exercise, there is a possibility to develop certain swimming injuries, so be aware of them! We have seen that swimming has a lot of benefits to the body. But it doesn’t stop there! Swimming also has psychological benefits. Check them out! Swimming also becomes addictive — good, but a habit that is sorely missed if skipped for a couple of days. Yep I agree , swimming can be addictive – but what a healthy addiction. Swimming really keeps you healthy and in shape.